Todays post is rather special as it will be the first one I have done since I have completed my first year volunteering on the Mid Hants. My actual first year was completed at the end of September but with my wife giving birth to my second child in September, yesterday was the first I have been able to work on the beast since then. On the way into the yard I also got a rather nice treat of seeing Class 50 “Indomitable” in her new NSE livery. But back to Canadian Pacific, I spent most of my day using a needle gun to strip the paint on the back of the frames so we can actually see what the state the metal is in. I am pleased to report (as you can tell from the photo) that the back end is in very good condition and will not require much work. Stripping the paint on the back end also means that there is no trace of the BR Express Blue paint left on the loco, indeed there is more in my hair as I write this then on the actual locomotive! As we removed the paint we did discover that we had some BR Express Blue and primer on top of a layer of BR Green so it does give the impression that when Canadian Pacific was painted Blue they just primed over the old Green rather stripping it back as we are doing. 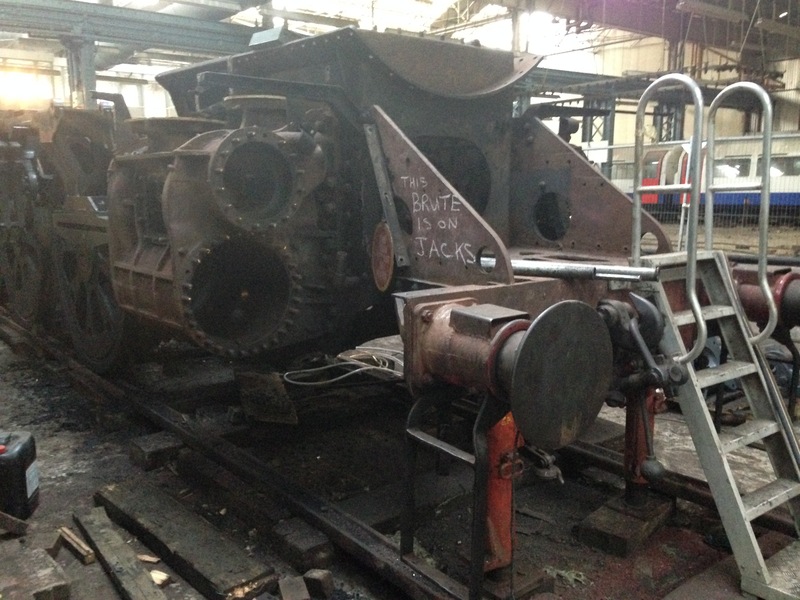 The locomotive itself seems to be in good condition and we havent discovered any problems that we were not expecting which is brilliant news for us, as we try to complete our strip down and inspection of the 8P beast. 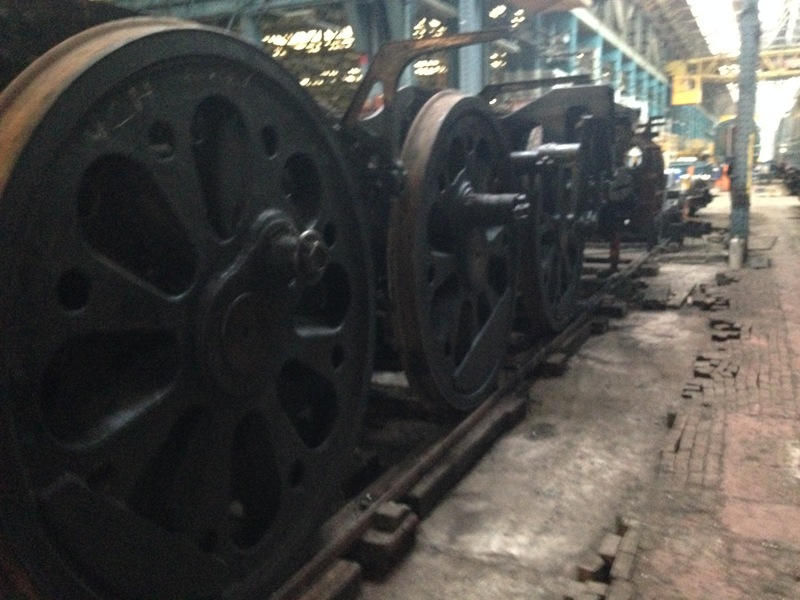 We still have to get the frame off the driving wheels and take a look at them, which means there are loads of potential headaches ahead, so we are not counting our chickens just yet. 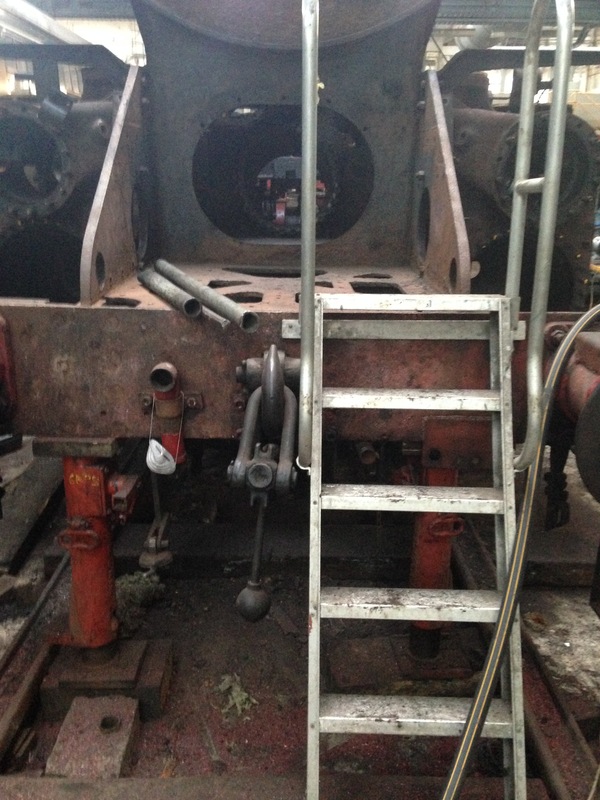 Both the front bogie and the rear pony have been completely stripped down and look to be both in good condition. The front bogie will require a few new rivets and a few other small parts so there are no problems with that as it stands. Like I have said in previous posts I can only comment on things I have done myself and not in a position (lack of knowledge) to comment on the rest of the locomotive. A more rounded and informative progress report will appear in the latest MHR members magazine and hopefully on the MHRs website as well. Seeing as I have completed my first 14 months as a volunteer I thought it would be a good idea to reflect on my experinces. I have got to admit that when I first got involved with the beast when I first started all those months ago, I was not sure how much help I would be as I have very limited knowledge of Bulleids (I prefer Castles and Kings if I am honest) and no real experince in heavy engineering but with the help of the brilliant volunteers in the CanPac team I have learnt so much and developed so many new skills; it’s amazing. I would suggest anyone who is thinking about volunteering on a railway project to get involved as you will have a brilliant time. There is far more to the railways then just steam locos and there are lots of differents departments you can get invovled with, like Alex on the GWSR who volunteers in the carriage works. 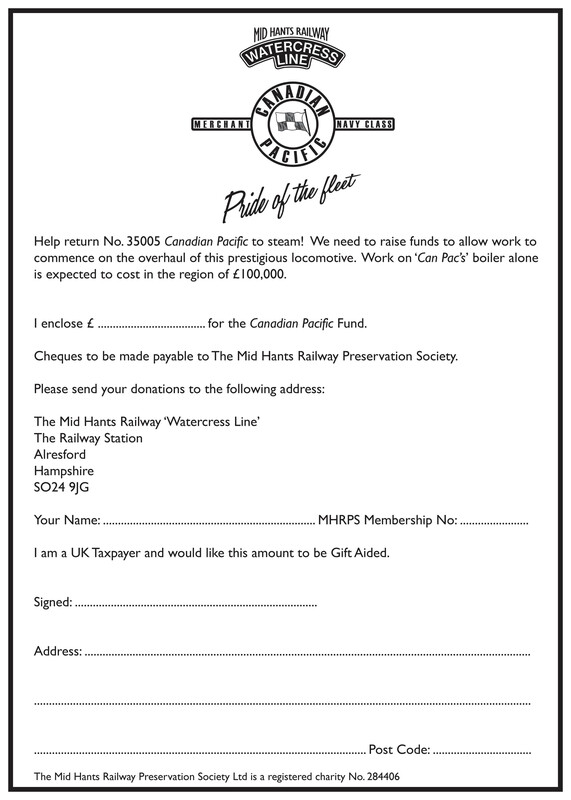 The Mid Hants volunteers on this project have dedicated an amazing amount of time and energy to Canadian Pacific’s stripping down, we just need to get the funding in place to get the restoration started. The quicker we get to £100,000 the quicker we can get this beast thundering up the Alps hauling passenger trains again. As I have mentioned before, the boiler work alone is expected to exceed £100,000; so anything you can give will be gratefully appreciated, no matter how small you think it might be. Please click here to contribute towards the fund via secure online payment. Both links take you to the Mid Hants Railway Website which is where you can find out more information on how you can help. Thank you. Don’t Forget to check out the Brookes Castle – Volunteer Diary to catch up on previous posts! Heres to a great first year and hopefully many more to come, thanks for reading. Do you know if it’s normal practise to scrape the paint off a loco before a repaint then? With our coaches we just slap it on the existing livery, so if you sand down a bubble for instance you can still see all the original colours. If you get a good one you can see the original maroon, blue and grey, then an intercity livery, an old blood and custard livery from early preservation, maybe a newish coat of chocolate and cream and finally a fresh coat of maroon! You would assume its normal practice to scrap the paint of the loco so you can see the actual metal and check its quality during restoration/overhauling. I can understand painting over the paint whilst the locos in ticket as thats not an issue. You might be more interested in my next entry as I believe I will be working on a set of coach bogies for a Bulleid Brake Coach, which should be fun. sounds good, I don’t go anywhere near them usually, far too complicated, I’ll stick to what’s above the solebar. Only time I ever do bogie work is helping push them round the yard! Yep, plenty to be doing, we can now work on 4 coaches at once and do a quick job on one (repaint and a bit of filler) in about a month, so lots cominh through! Sounds exciting, just need to get 35006 to get into steam so I can come and visit the GWSR!